“DRAIN, JAMES R., D.C. (b. Kendrick, Idaho, May 10, 1891, d. San Antonio, Texas, Feb. 27, 1958). 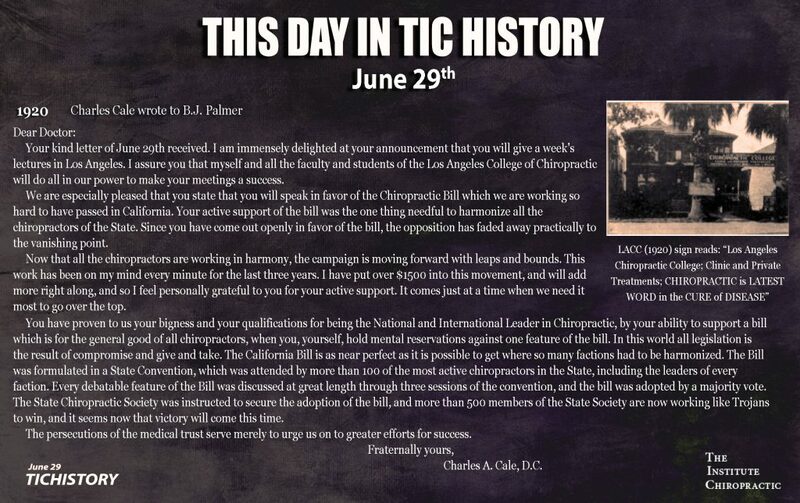 A pioneer educator, an author and lecturer of wide repute, James Riddle Drain was also one of chiropractic’s most influential lobbyists. 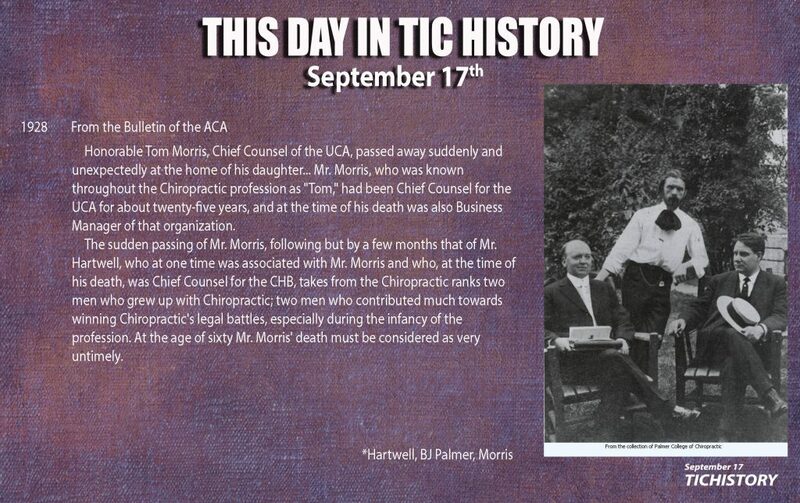 He was active in the profession for over 45 years. 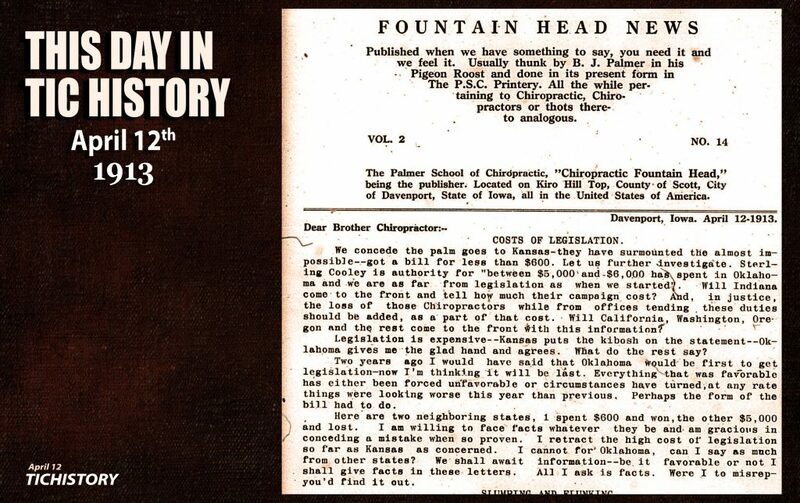 James R. Drain was a resident of Scott City, Kansas, at the time of the widely publicized trial of pioneer chiropractor, Dr. LB. Hall (see Necrology, this edition). 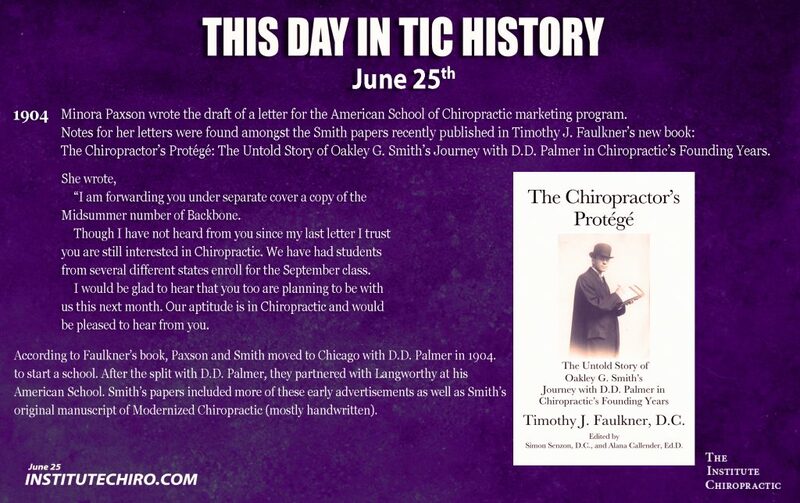 It was this event that provoked Drain’s interest in the profession and· his subsequent studies at the Palmer School of Chiropractic. 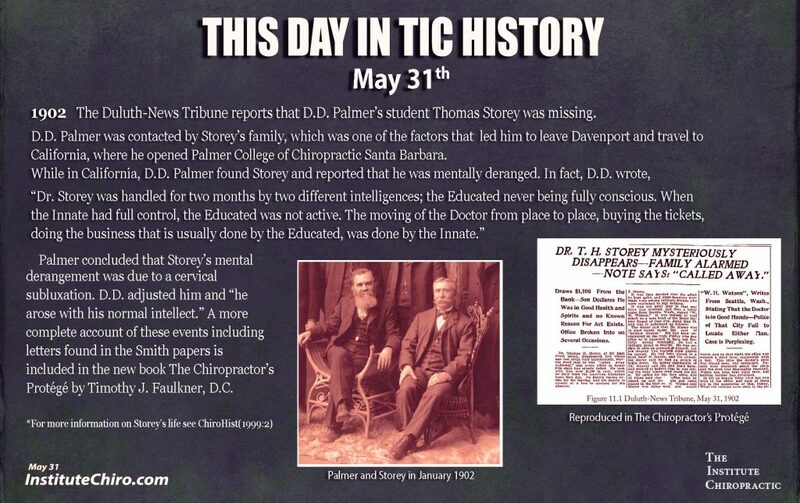 Receiving his D.C. degree in May, 1912, he returned to Scott City, where he practiced until 1919. 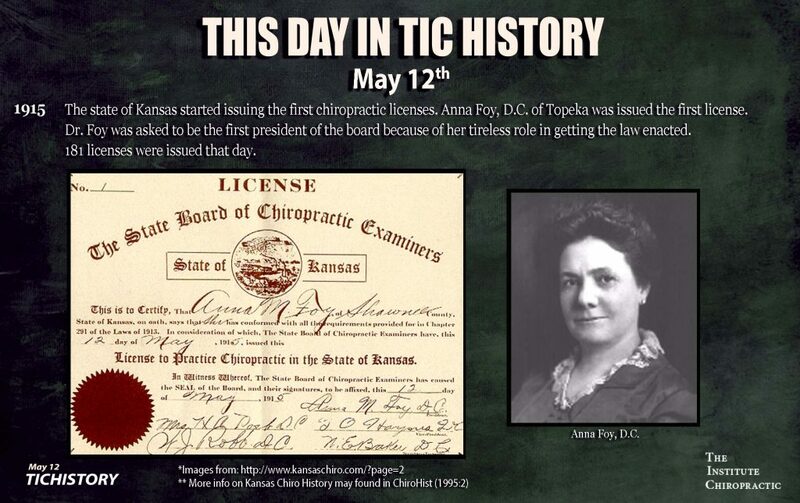 He also participated actively in the campaign for legalization of chiropractic in Kansas (the first state licensing law) and was among the first to be issued a license. 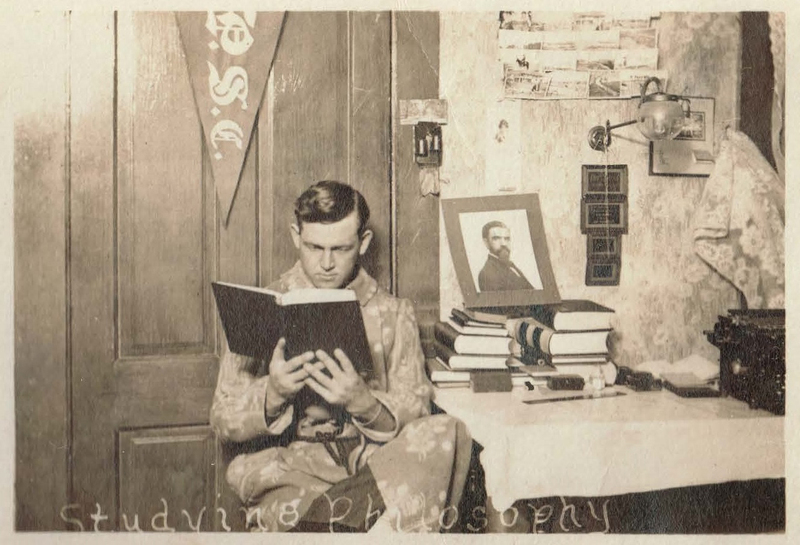 Moving to San Antonio, Texas, in 1919, Dr. Drain became associated in practice with Drs. 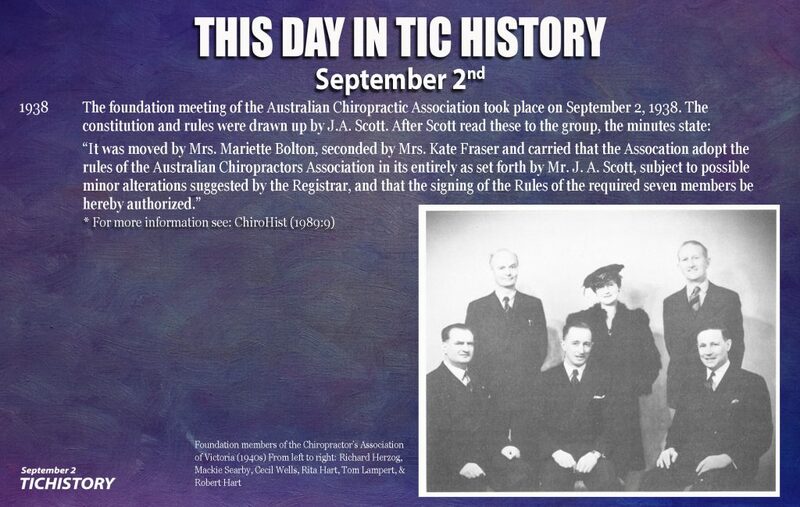 B. F. and Flora M. Gurden and then in the operation of the Texas Chiropractic College, which was founded in 1908. 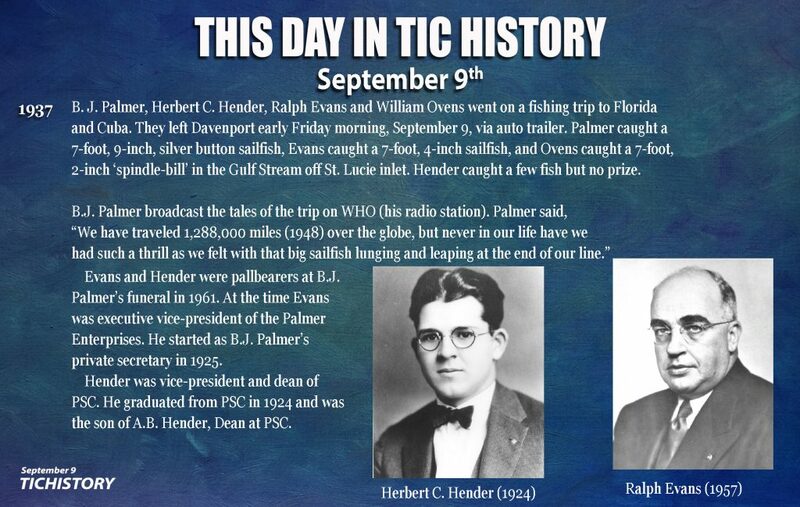 In March 1920, the school’s charter was purchased by the trio and Dr. Drain was named president, a post he held for 34 years. 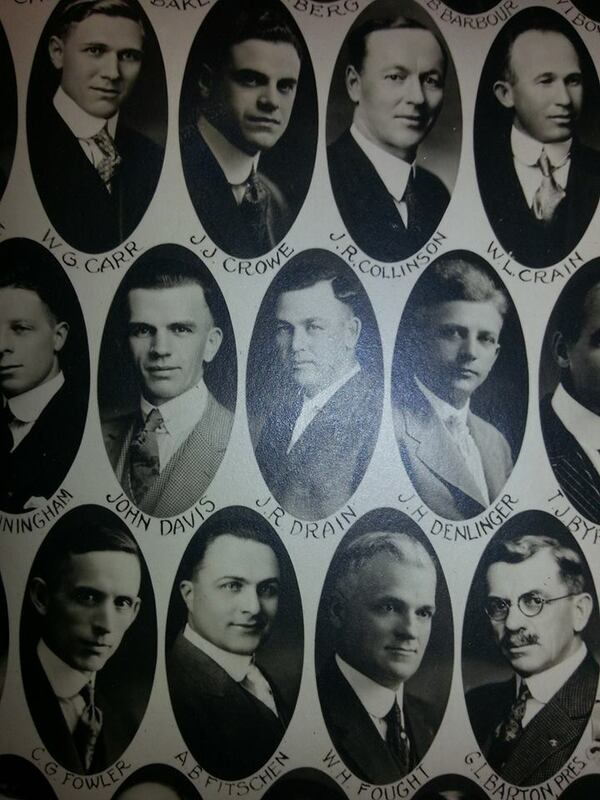 “The school prospered and did very well until 1929.” By this time, ownership was in the hands of Drs. 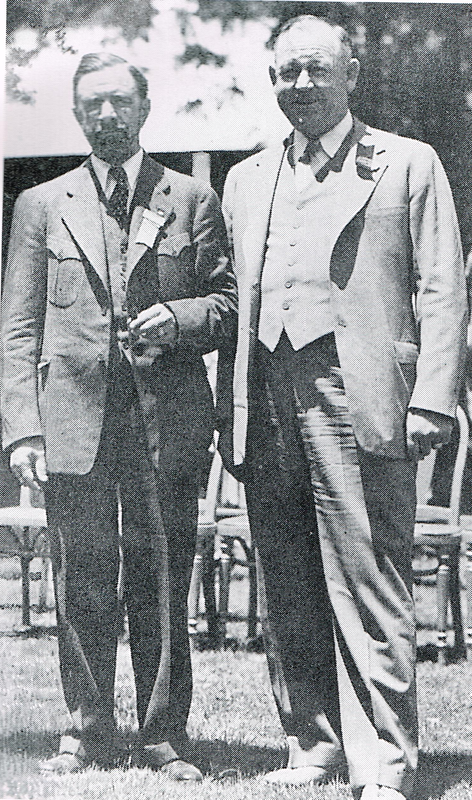 C. B. Loftin and H. E. Weiser in addition to Dr. 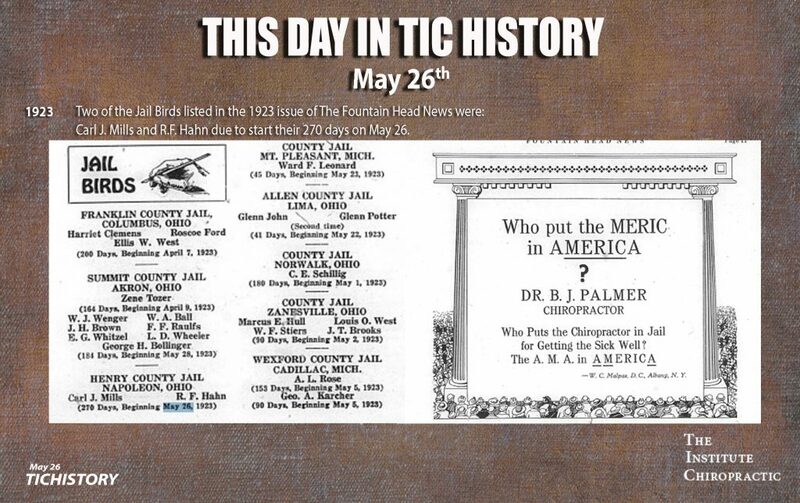 Drain, and the onset of the Great Depression caused severe hardships. 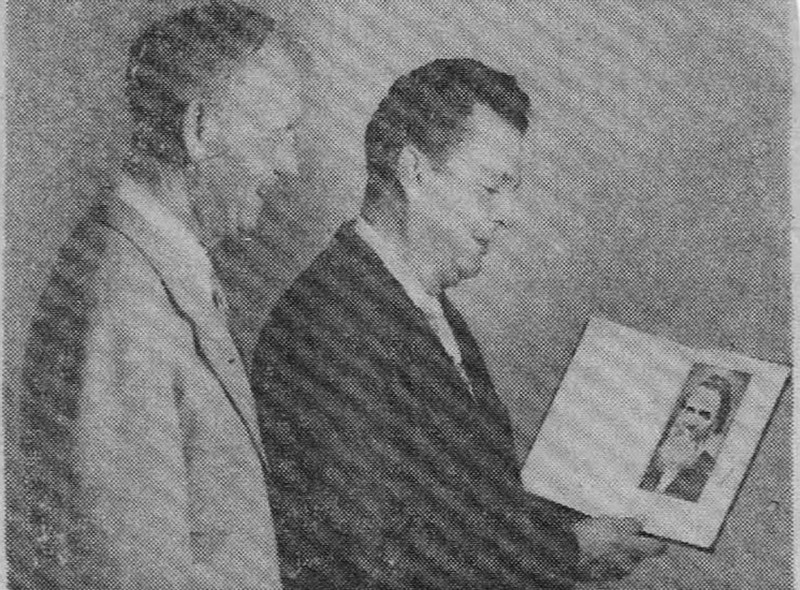 Both Drain and Loftin lost their homes, “but they managed somehow to keep the school alive.” The college was purchased by the alumni association in 1948. In addition to his responsibilities as an administrator, teacher and practitioner, Dr. 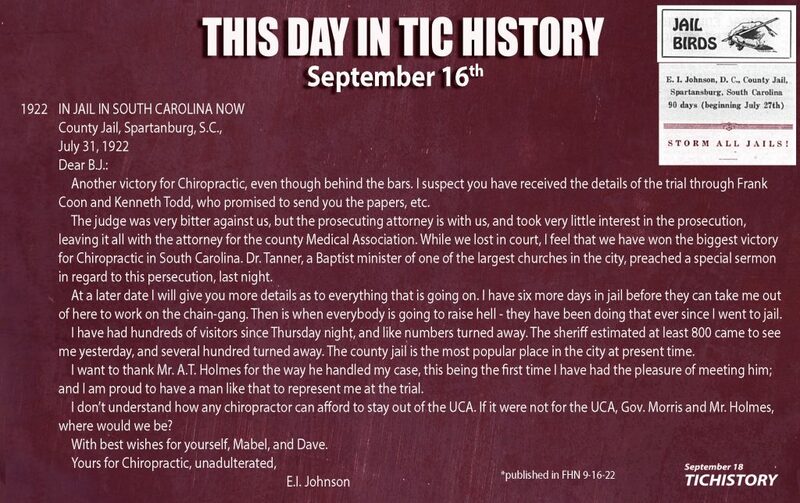 Drain traveled through Texas and Louisiana for years, mostly at his own expense, testifying at chiropractors’ trials as an expert witness. 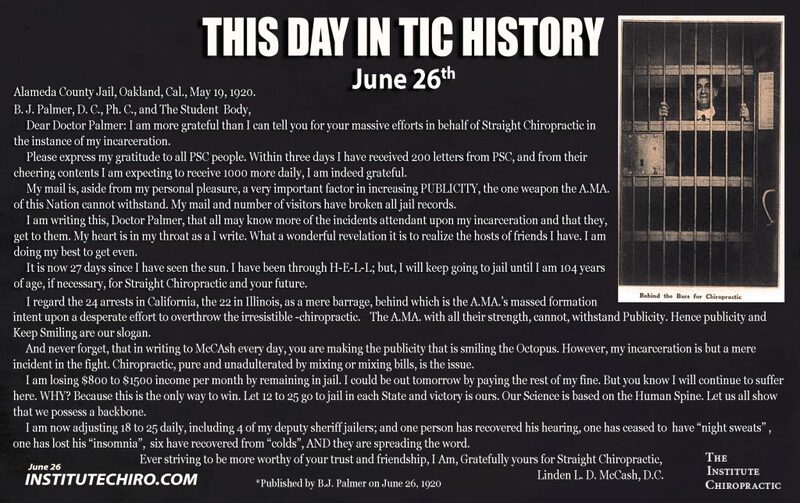 He was jailed one night for his own protection in Columbus, Texas, and he was the only D.C. ever charged with “About to practice medicine without a license,” a charge promptly thrown out of court. 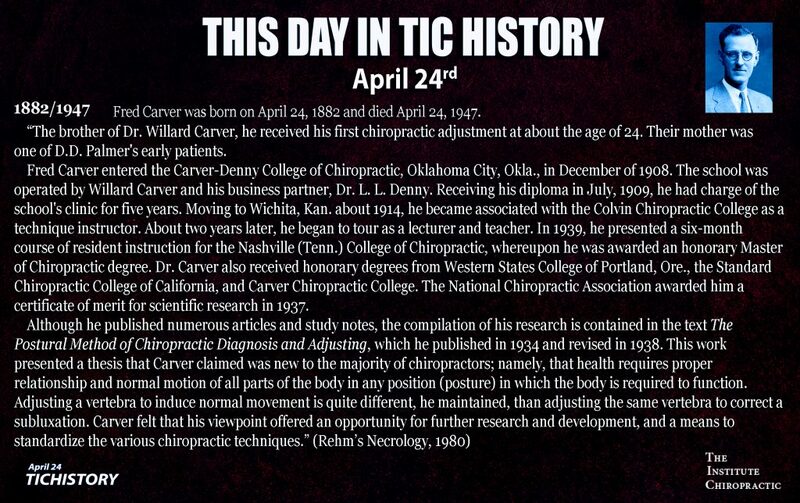 Although he taught many technical subjects, chiropractic philosophy was his favorite. 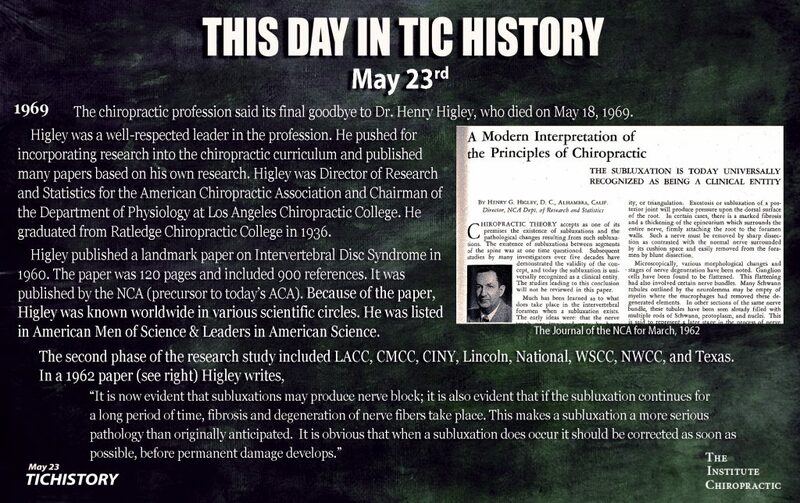 This is evidenced in his writings, which include two editions of Chiropractic Thoughts (1927, 1946) and his last effort, Man Tomorrow (1949). 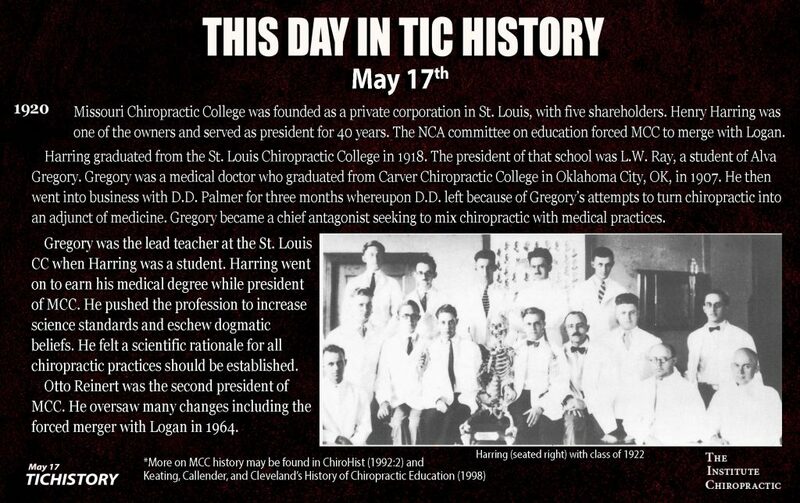 Due to his enthusiasm and success, 12 members of his immediate family, including his parents, wife, son, daughter, brothers and sisters, became chiropractors. 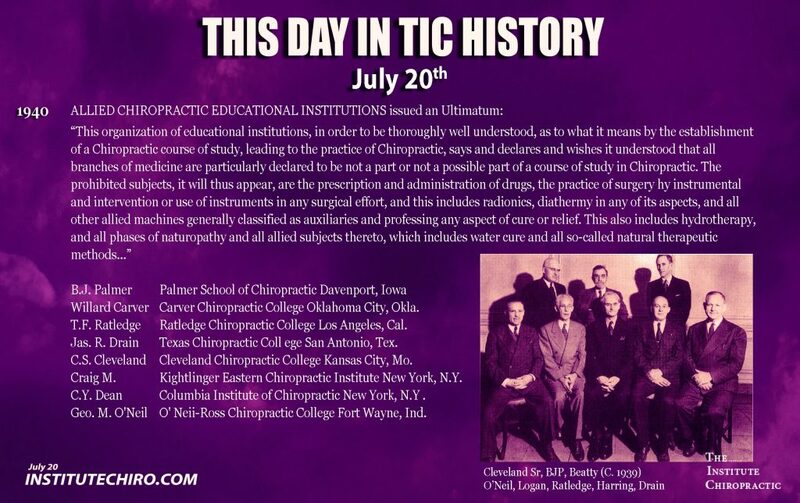 Chapter one from Chiropractic Thoughts (1927) includes many of Drain’s central tenets. Interestingly, he gives D.D. 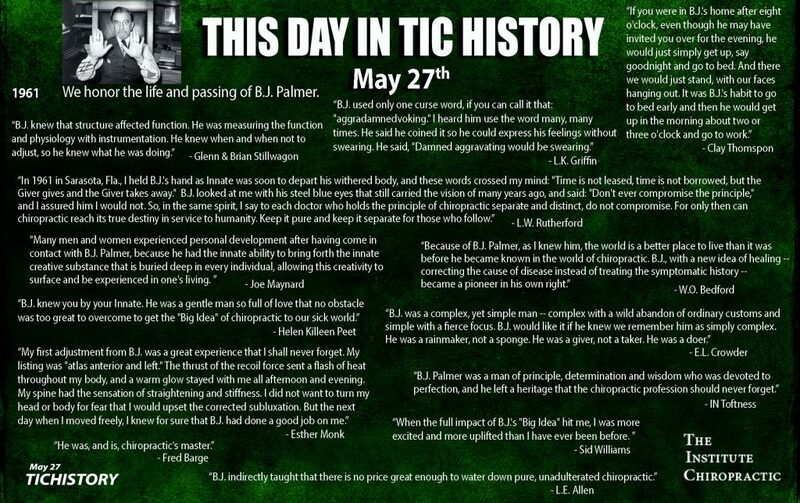 Palmer credit for B.J. Palmer’s theory of Creation, Transmission, and Expression. This is possibly because B.J. Palmer published a second edition of Vol. 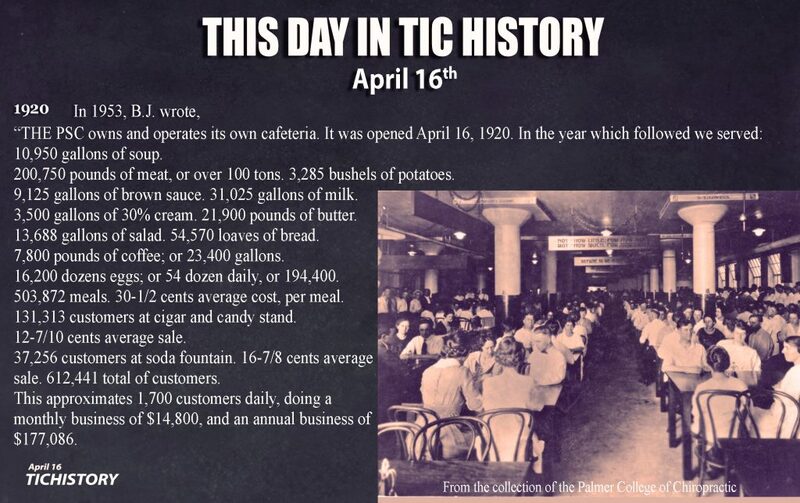 1 in 1910, just before Drain matriculated to PSC. 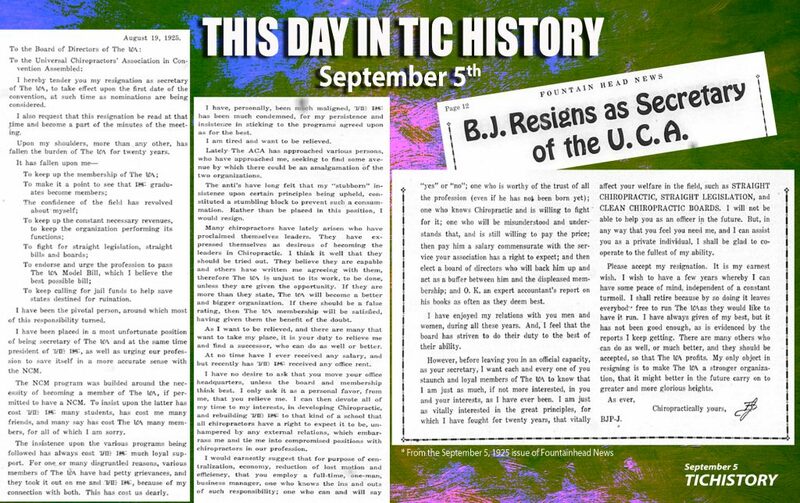 In the second edition, B.J. 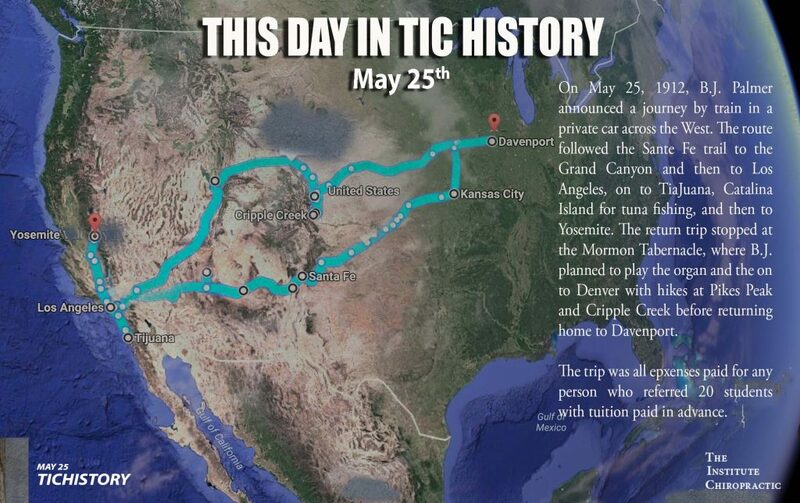 included many of his own newer theories even though he kept D.D. 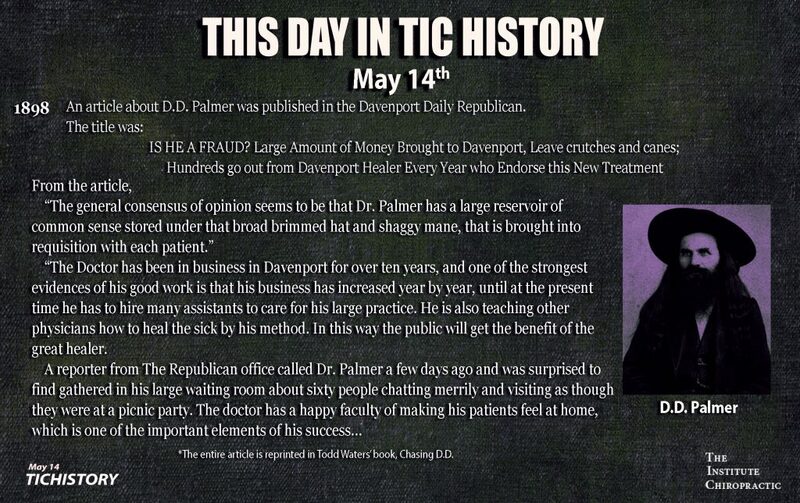 Palmer’s name on the text along with D.D.’s many chapters. 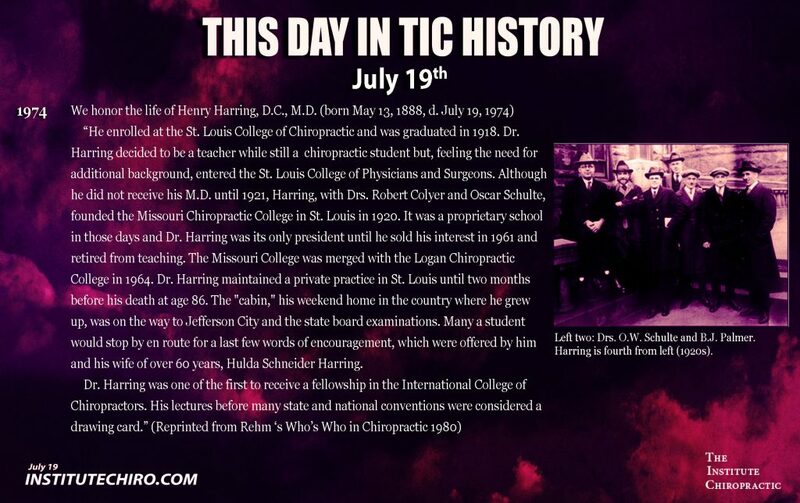 CHIROPRACTIC is a philosophy, science and art of things natural, and a system of adjusting the articulations of the spine, by hand, for the elimination of the physical representative of the cause of disease. 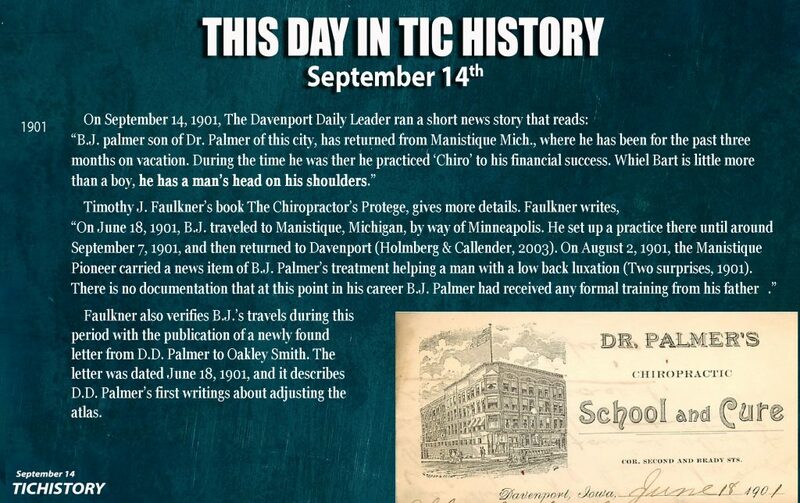 Chiropractic was discovered by D. D. Palmer in September 1895. 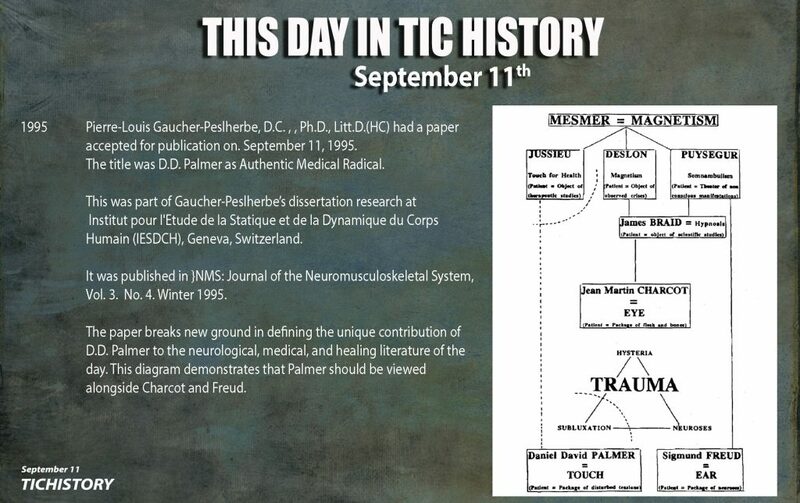 He based the science of the cause of disease on anatomy, philosophy and neurology. 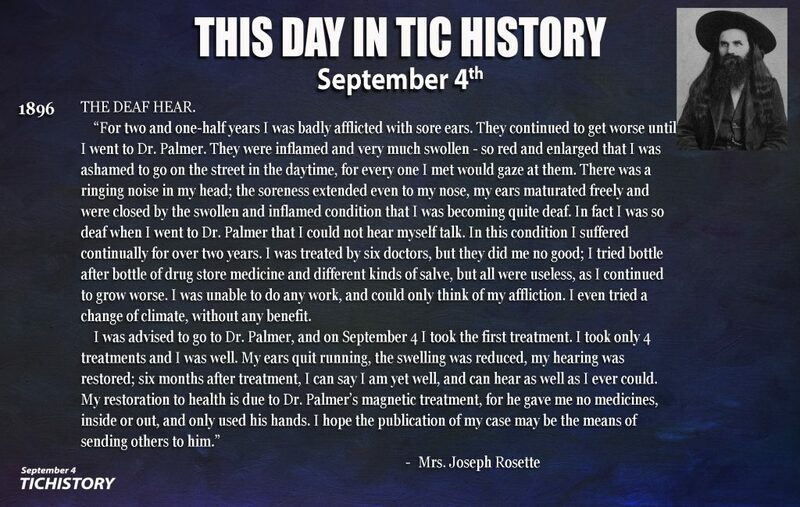 D. D. Palmer was a magnetic healer; not anything else. 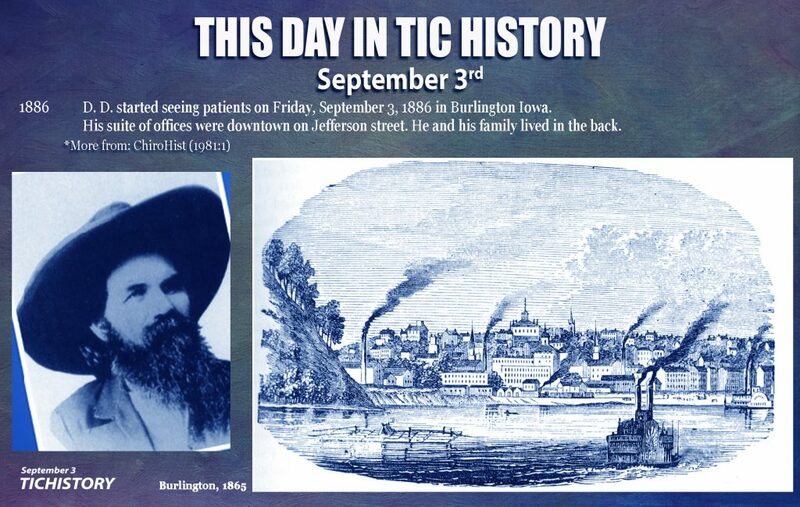 His method was such that he was placing his hand on the head, the back of the neck, the spine, and the front part of the body, and in so doing he noticed irregularities in the spinal column. He had an idea then that this was not natural, so he started to find out through a series of investigations what was natural. bodies in the name of Innate Intelligence. In the healthy individual we have natural amount of energy, or life, or force—just as you wish to call it—operating through the body, which is to be normal in the proper amount of time. Now, if we have the natural amount of force going through the normal amount of body in the proper time, quality and quantity, we have a normal individual. We have the force—everybody can see it—operating through the body. No one denies that such a force exists in the body. So we will have to make an explanation of the operation of this force from the outside, into the body and through the body. We, as Chiropractors, use the cycle idea to explain the operation of this force through the body. First, the force is created, or caused to exist, in the brain cell using the afferent nerve as a medium. Then it is transmitted from the brain cell over the efferent nerve to the tissue cell where expression of this force takes place in the tissue cells. This expression of force in the tissue cells is known as function. Function means the office of any organ of the body. This expression sets up vibrations in the tissue cells; these vibrations press upon the ends of the afferent nerves and afferent nerve then is impressed with vibration. This impression is carried to the brain over the efferent nerve, where it is interpreted. Interpretation means intelligent reasoning upon an impress-ion in the brain. This was D.D. Palmer’s idea of life, the three primary principles of life being Creation, Transmission and Expression. Intelligence, or Nature, says that the heart must beat seventy-two times per minute in order that we have the natural blood supply in the body. Force has already been created in the brain cell to make the heart beat, and to make all the other organs function. So Innate Intelligence endows units of force with a mentality that is just the same as giving these units of force orders to make the heart beat seventy-two times per minute, or that is, perform the normal function of the heart. 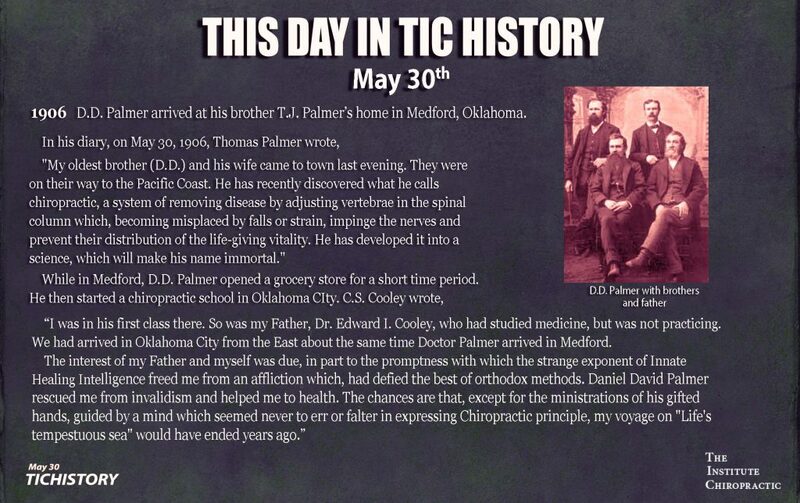 Dr. Palmer was not a man of letters, so his idea was not named Chiropractic by him. He called in his friend, the Rev. 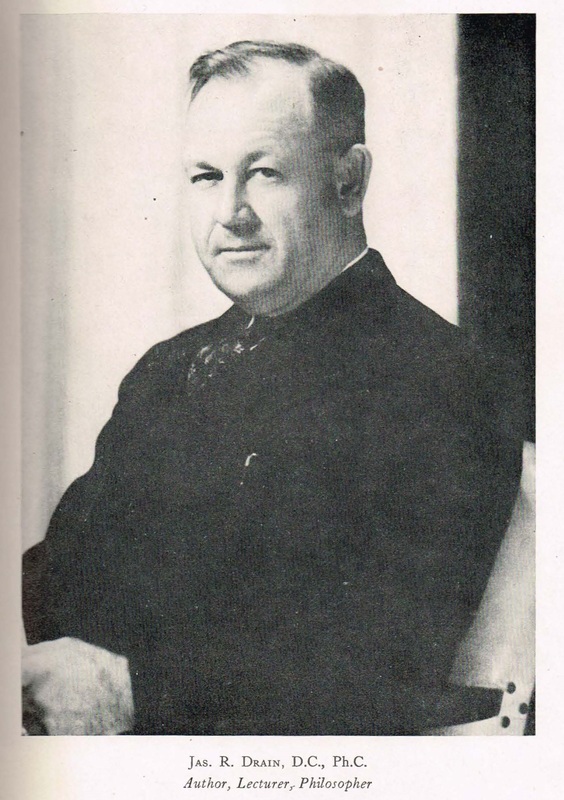 Samuel H. Weed, and asked him to name the new idea. 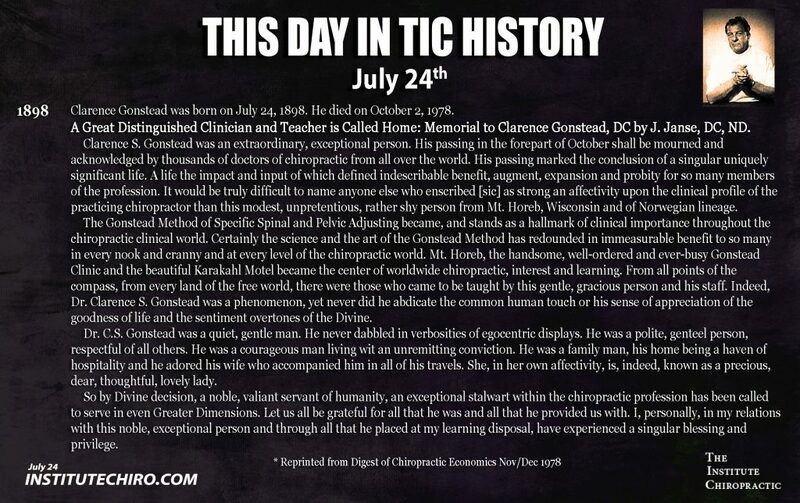 He named it from the Greek language, Chiropractic, meaning hand practice. 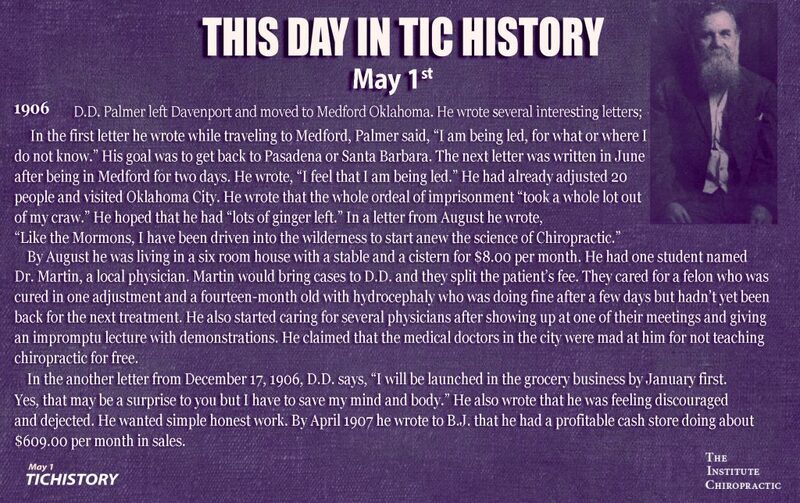 Then Chiropractic was a hand practice. That did very well for several years, but somebody said that sawing wood was hand practice, so it means something else today. 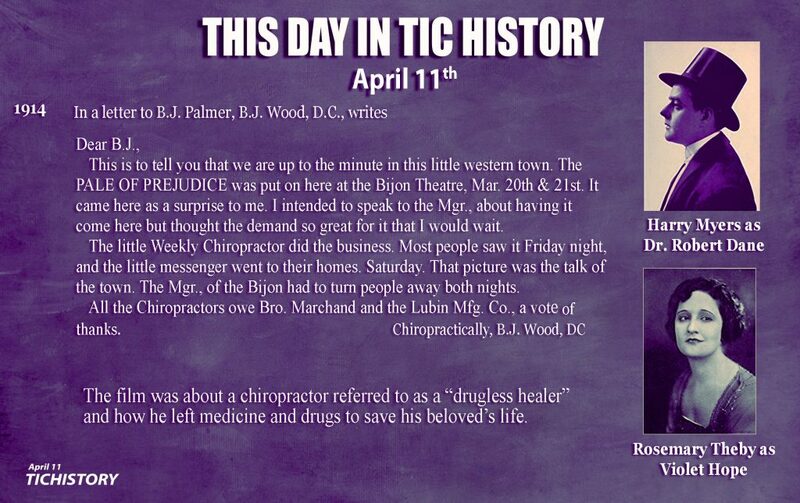 That is why I gave you the definition of Chiropractic in the beginning—so you would get the idea of what it meant. Since we know of what a normal function should be, we want to know how the body must be in order that it function normally. We, as Chiropractors, claim that if the spinal column is in perfect alignment we will have normal functioning of all the organs in the body. comparing each with the one above and one below in order to know whether any one vertebra in that spine is out of plumb with the median line. The median line is a middle line—a line drawn from the occipital protuberance to the tip of the coccyx. Then we compare these vertebrae and notice whether they are out of alignment or not. We verify our palpation and our listing of vertebrae, by nerve tracing, which is a method whereby the chiropractor places the first finger over his index finger, which is the second one of either hand. We make pressure at the intervertebral foramen with a little rotary movement, and if the patient complains of pain, then it will verify the subluxated vertebrae. The X-ray is accurate in verifying the lateral listings of the vertebrae of the spine. 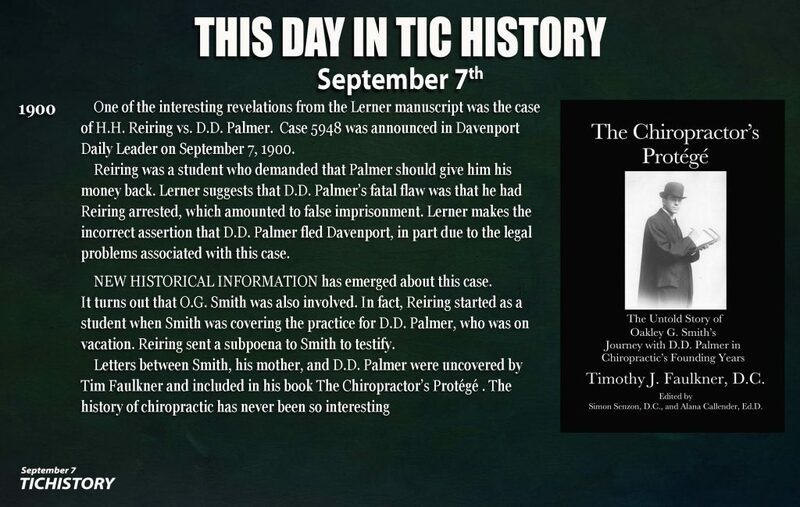 It does not list posterior vertebrae, but it does list lateral subluxations and superior and inferior subluxations, so it is a valuable asset of chiropractors. A subluxation, then, is the thing we are looking for, because it is the physical representative of the cause of disease. A subluxation makes pressure upon spinal nerve coverings, and the coverings of the spinal cord, the degree of pressure depending upon the degree of the subluxation. A subluxation is a partial dislocation of a joint. We, as chiropractors, are interested in the subluxations of the vertebral column. So, a subluxated vertebra is one that has slipped slightly out of its normal relationship between the one above it and the one below it. There can be eight subluxated vertebrae in one spine at one time, and everyone has from three to five who has not taken adjustments. Since we know that there is such a subluxation, we ought to know what it causes. 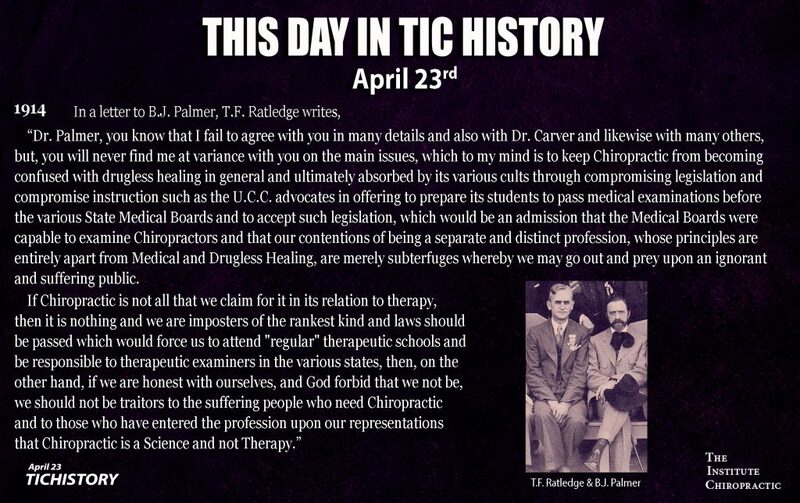 It was thought, up until 1905, that the subluxation caused the disease, but it was decided by a convention of chiropractors that a subluxation was only the physical representative of the cause of disease, that the real cause of disease was lack of mental impulse being expressed in the tissue cells and that is what we recognize today—that it is the lack of mental impulse being expressed in the tissue cells that is the real cause of disease. 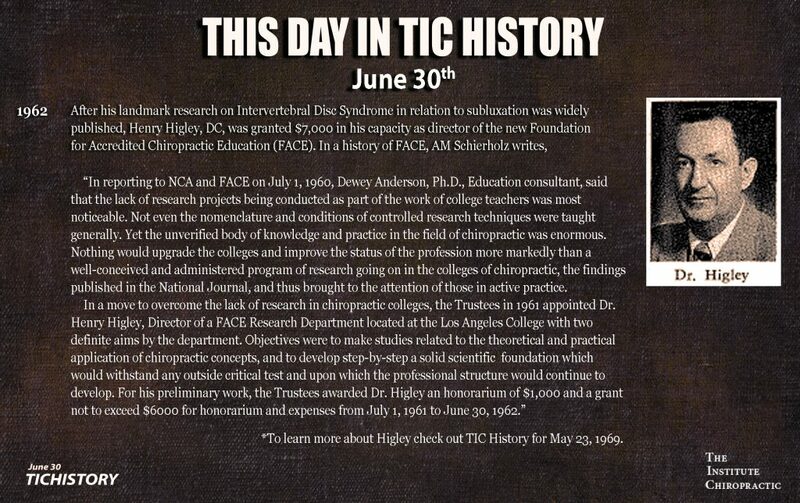 In order for us to be scientists, we must know now how a subluxation is produced. The most of you when you went to a chiropractor heard that falls, sprains, jars or the introduction into the system of poison caused the subluxations. That is true, but that is not enough. We have natural resistive force inside the body that is used by the Innate Intelligence to adapt it to normal and abnormal conditions or normal and abnormal forces from without. We call this natural process Intellectual Adaptation. So long as Innate Intelligence then can adapt herself to the forces from the outside and the inside by her natural adaptive forces, we have a perfectly functioning body; but if the outside forces or internal forces are stronger than the natural resistive forces in the body, we have a concussion of forces and we saw that the concussion of forces comes as a shock to the body and produces subluxations in the spine for the simple reason that the spine is the line shaft of the human body. 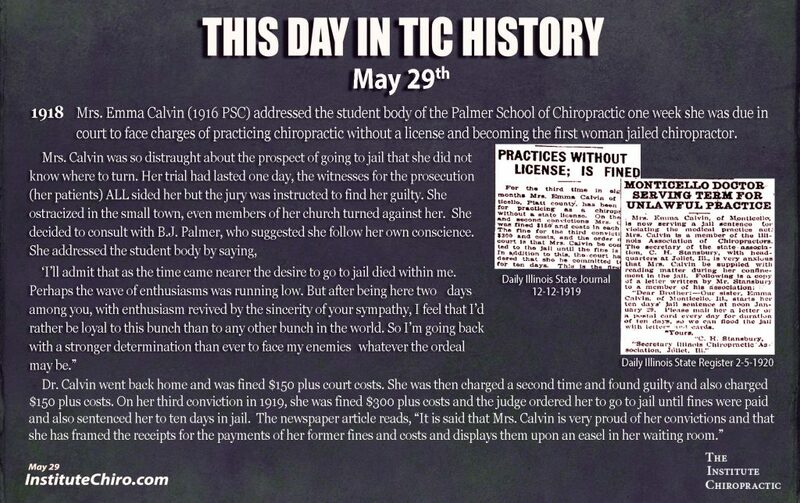 Did you ever stop to think that all the rest of your body is attached to your spine? It is. And these concussions of forces awkwardly applied to the body from the inside or from the outside, produce abnormal vibrations which center upon the spine and cause subluxations of the vertebrae. We might get an awkward concussion of forces from breathing bad air, from drinking impure water, from thinking bad thoughts, from taking cold baths, from taking hot baths, from sleeping in a draft, sitting under a fan, becoming excited or getting emotional—getting mad, wearing tight clothes, and thousands of other things that do not come to my mind at this time—looking at things that we should not look at—I mean like a blacksmith looking into a red hot fire which produces subluxations in the spine which affect his eyes until soon he is blind. 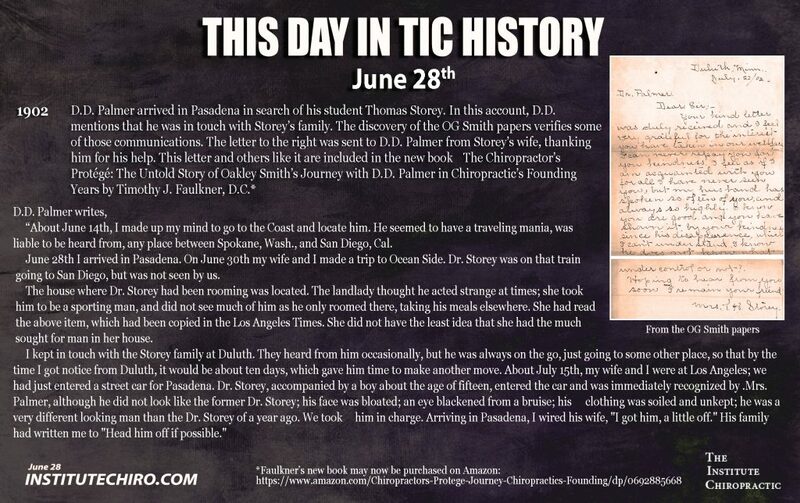 There are thousands of ways then that subluxations may be produced, and I want you folks to have plenty of ways to explain so that when you explain Chiropractic in your office and your old patients are listening they will listen to a new story every time they bring people to you. 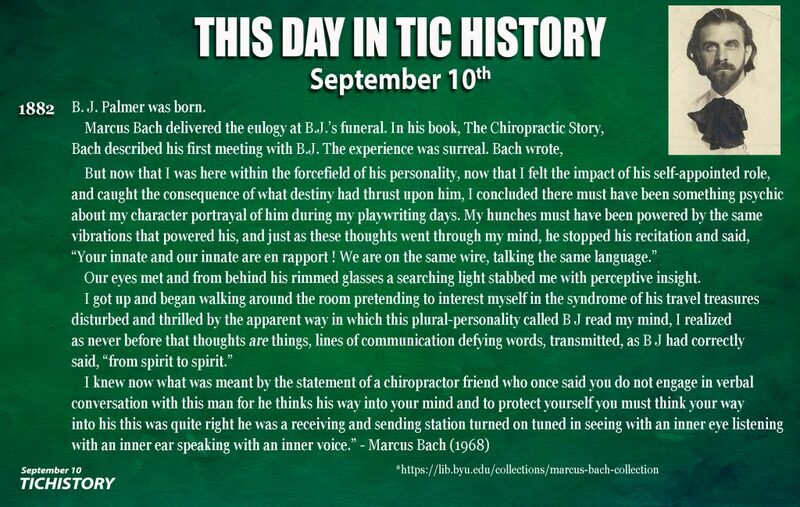 I know a chiropractor who used the same explanation every time you went into his office, so it became a bore and you didn’t like to bring him patients. 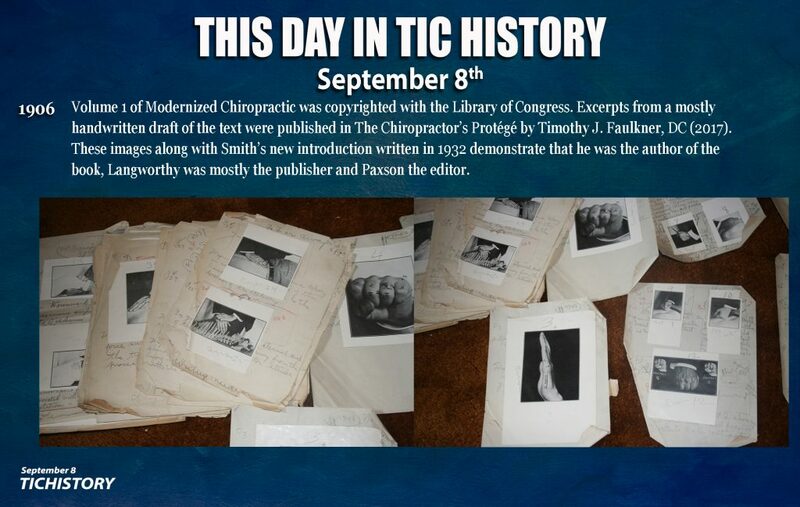 I have hundreds of explanations of the Science of Chiropractic. Since we know how subluxations are produced, it is necessary that we know how to correct a subluxation; and I want to add here that the adjustment of a vertebrae is not the only thing that corrects a subluxation. 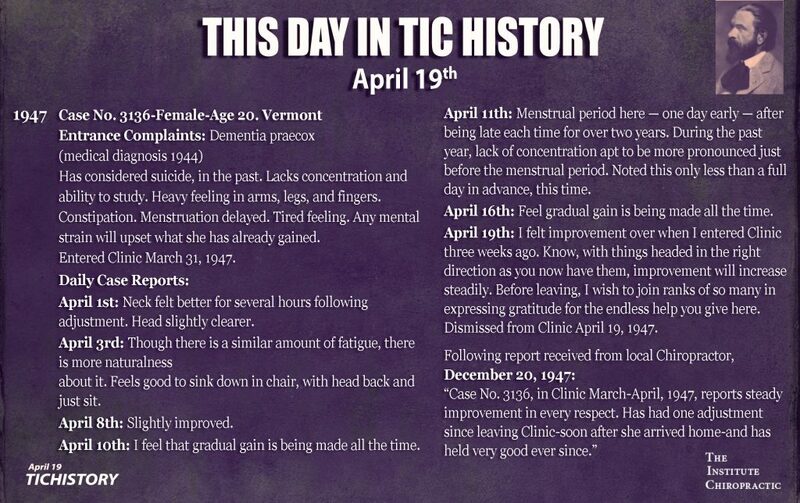 Innate Intelligence with her adaptive process corrects more subluxations every minute than all the chiropractors could correct in a thousand years. That is the natural function of Innate Intelligence to correct the subluxations that come in your spine during your day’s labor; that is what she is supposed to do while you are asleep. 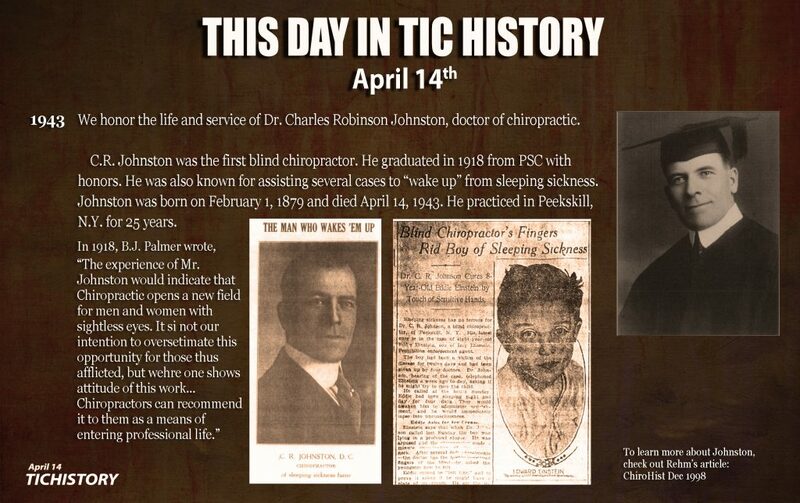 If you do not take the proper sleep, she cannot adjust the subluxations, and then you wonder why you should be sick in your young days. If you will just reflect, you will find that you have not been taking the proper rest and have thus prevented Innate lntelligence from correcting the subluxations. 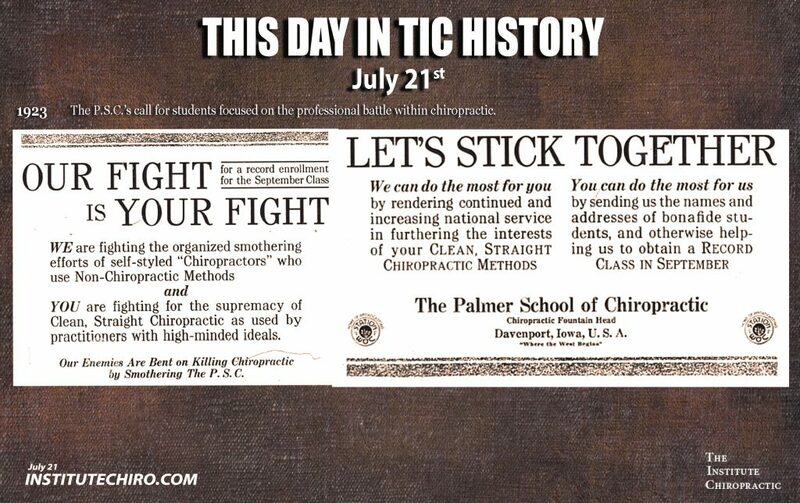 We have, as chiropractors, a method of adjusting subluxations. Adjusting means putting the vertebra back in its proper position with the one above and the one below. We use the toggle recoil adjustment at this particular time because it accomplishes an adjustment quicker than any other movement known. We use toggle recoil because we can direct our forces scientifically and move a vertebra in three directions at the same time with our toggle recoil movement. 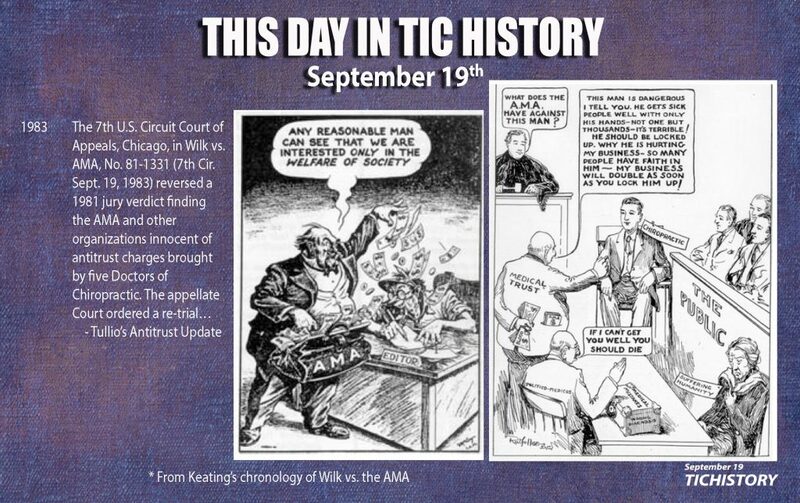 This adjustment is given with a quick thrust and quick recoil in order that Innate Intelligence might contract her forces in the shortest possible time and make the adjustment. Our thrust is not one-half of the adjustment. We deliver a concussion of forces scientifically and Innate Intelligence adapts herself completely to the thrust, and this is known as a contraction of forces on the part of Innate Intelligence that is very necessary in order to make an adjustment. If we never get an innate contraction of forces following a thrust we have not made an adjustment. 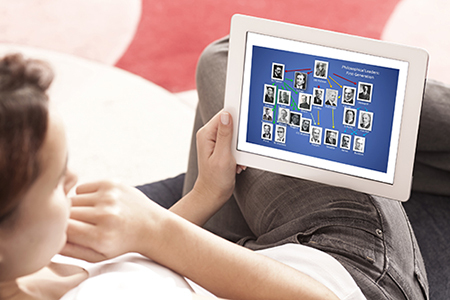 We believe that Innate Intelligence has a certain amount of reparative forces. 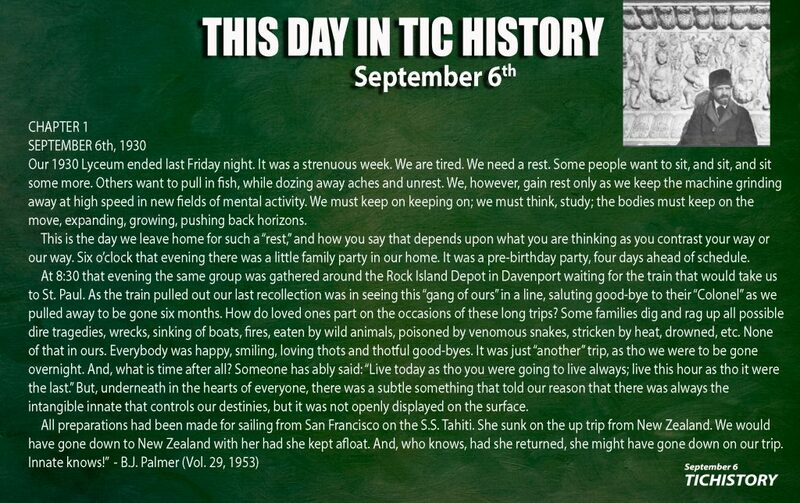 We know that she has nine primary functions at her command to use in making the body normal or in the adaptive process. 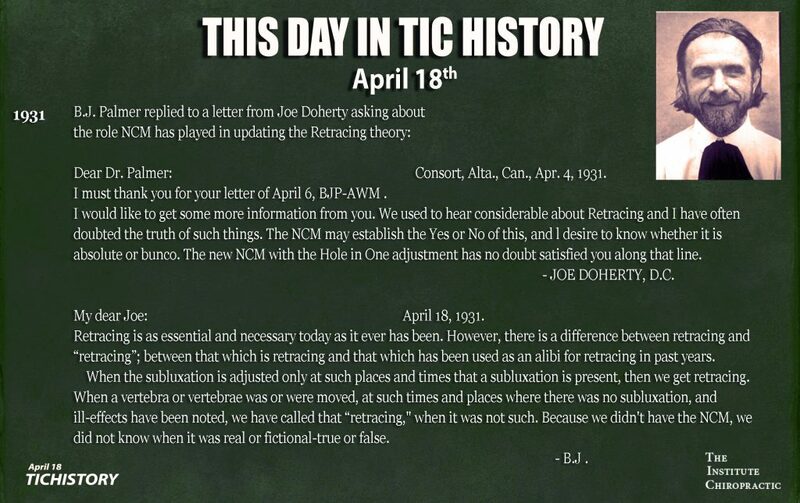 We give our adjustment to remove the cause of major conditions. 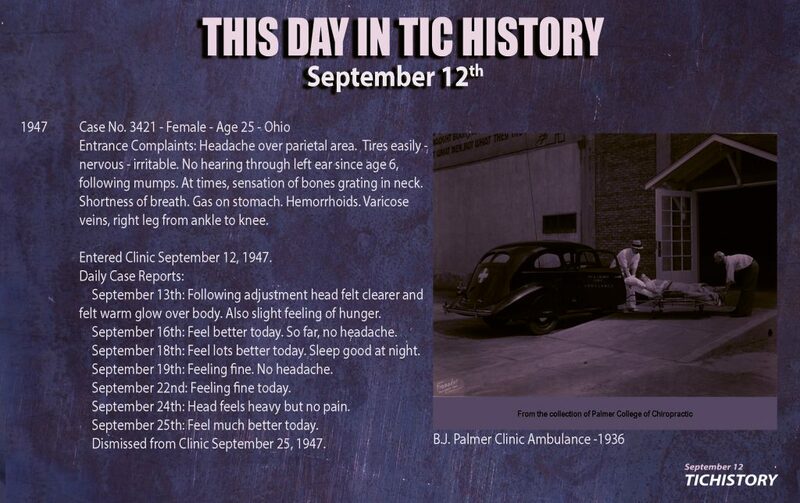 Major conditions are those conditions which are interfering the most with the life of the patient. Sometimes our adjustment is a one bone major and sometimes it is a major of two bones; sometimes of three bones, very rarely four bones. We do this for the simple reason that Innate Intelligence only has a certain amount of reparative forces to use, or for adaptive purposes. 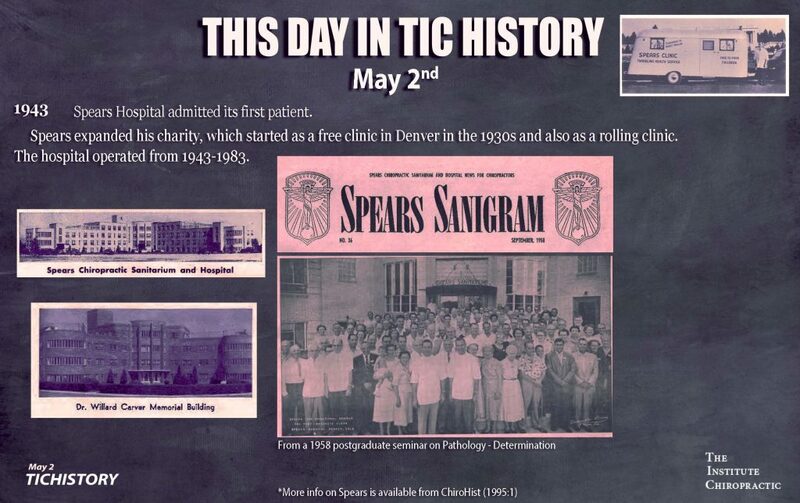 If we caused Innate to apply her adaptive forces to four places, you will readily see that it would take longer to repair the patient, scattering the force, than it would if we concentrated our force on one or two places. So that is why we use major adjustments. This adjustment is one that I have developed during the years that I have been actively engaged in giving adjustments. I used it before the advent of the posture position by B.J. 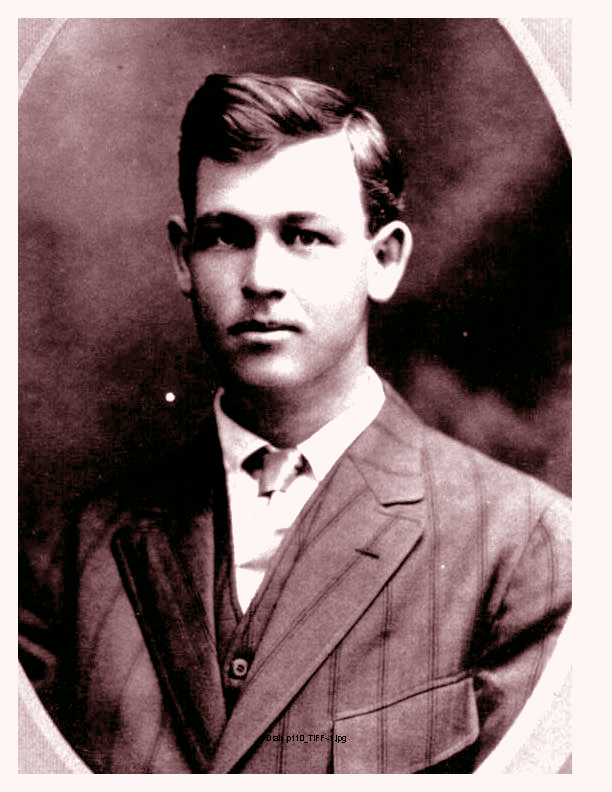 Palmer in 1922. 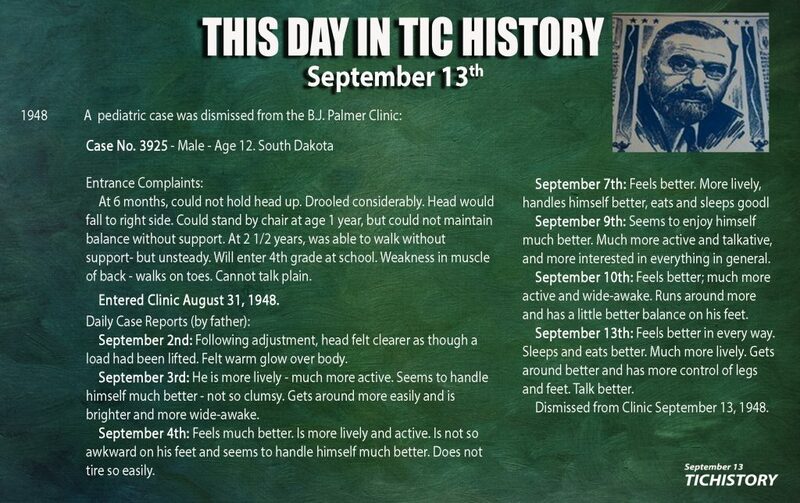 I was taught the posture position when I was in school in 1911, together with the straight arm adjustment that was then being taught, but it was considered dangerous and the thought was dropped at that time; so when the new posture was advocated by Palmer, I coupled it with my system of contact to have this adjustment for you. In the first place the table has to be considered. If the reclining table is used the head pieces must be adjustable, as well as the abdominal support and the back part of the table. In the posture position the table must be adjustable to height and the front part of the table must be always on a level with the hip joint. There is not any time when it is permissible to have this table lower than the length of the femur. The correct posture table should be adjustable so that the chest piece can conform to the different curvatures that are found in the spine. In the cervical region the knees should be in a position to relax these muscles. In some cases the knees will be drawn under the chest and in others the femur will be perpendicular. All depends upon the kind of neck the patient has. In the dorsal region, the knees should be placed in a position to relax all the dorsal muscles. 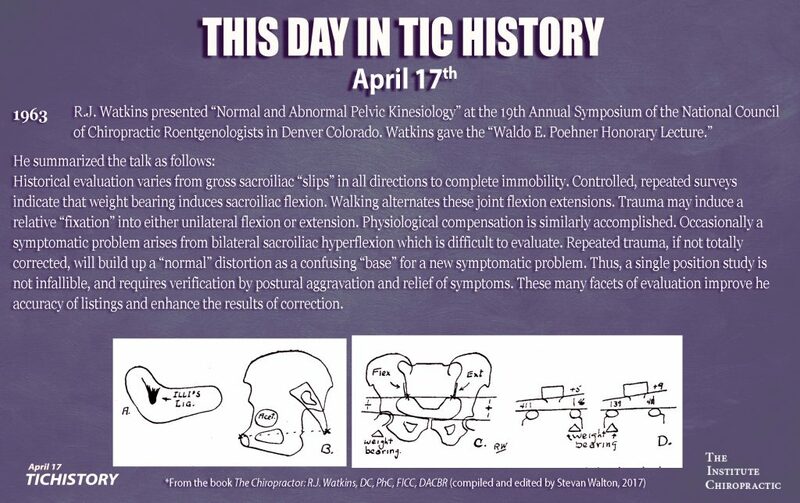 In some patients the knees will be brought slightly forward and in others they will be slightly backward from a perpendicular line of the femur. All depends upon the kind of back that presents itself for adjustment. In the lumbar region, we will find that there are more rotations than in any other section of the spine, and that one or the other of the knees properly flexed or extended, or put backward, will relax the muscles on the side of the contracture and permit the lumbar to move with ease. Placing both of the knees backward is not desirable because that would more often contract the lumbar than relax it. Now, the part that I have developed in addition to the position on the table, is the contact on the vertebra. 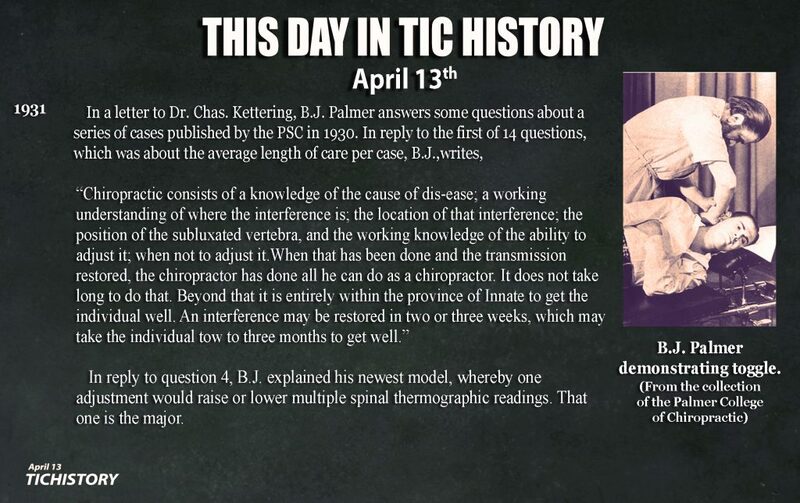 I maintain that in adjusting vertebrae we should take advantage of the abnormal position when we apply our adjusting force, and that if we do not take advantage of this presentation of subluxations, we are not applying our force scientifically. In subluxations where the transverse process offers a point of advantage, then I take the transverse contact. If the advantage point is between the transverse and the lamina, I take a pedicle contact. If the advantage point is the lamina of the vertebra, I take the lamina contact, and if the advantage point is the spinous, I take a spine contact; or if the mammillary process is the advantage point, then I take the mammillary contact. In other words, the point of contact will always be at the point of advantage, the same as when you go to lift a heavy load, you can lift it easier if you take advantage of it than if you do not. The thrust to give will be determined by the degree of relaxation that is gotten, and also the resistance that the patient gives when pressure is made on his back. When I take my contact, I use enough pressure on the patient’s back to take the slack out of his spine in the region that I am adjusting. The thrust that is used is not a wicked thrust, but a very light thrust and is painless in all cases except those of severe contracture and fever cases. 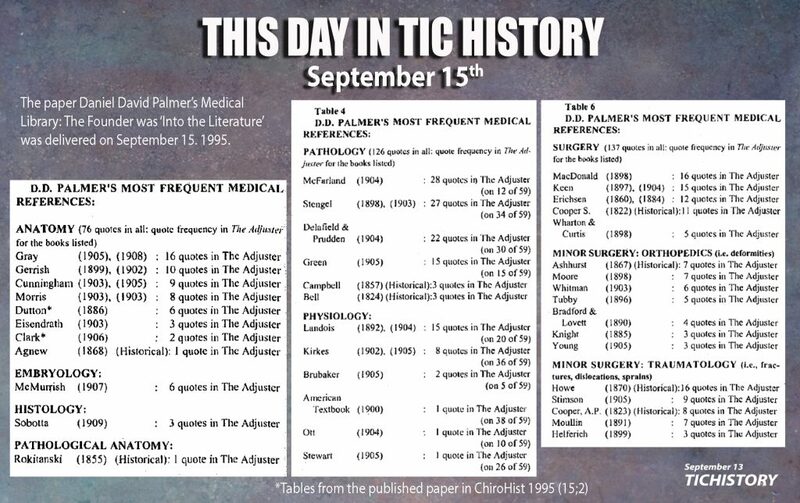 The pain that is associated with these cases is due to the congestion and inflammation, and even in these cases this adjustment is as near painless as any adjustment given by any individual under such circumstances. This method of adjusting cannot be perfected in a short while, but it can be perfected if time is given for concentration upon each subject. 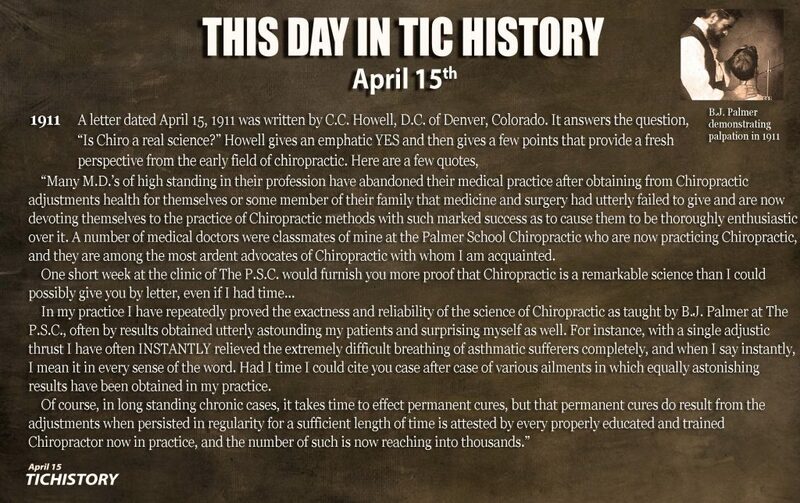 I have used all of the methods of adjusting that have been used in the developing process of Chiropractic, and I like this better than any of them. While I have not been letter perfect in all the other methods, I have been considered a good adjustor. I favor this method of adjusting. One reason is because it is mine, and another reason is because it is easy to take. While it is painful in some cases, I have never had a single patient complain of the adjustment leaving a “bad taste” in his mouth. We have never picked majors before analyses were made. 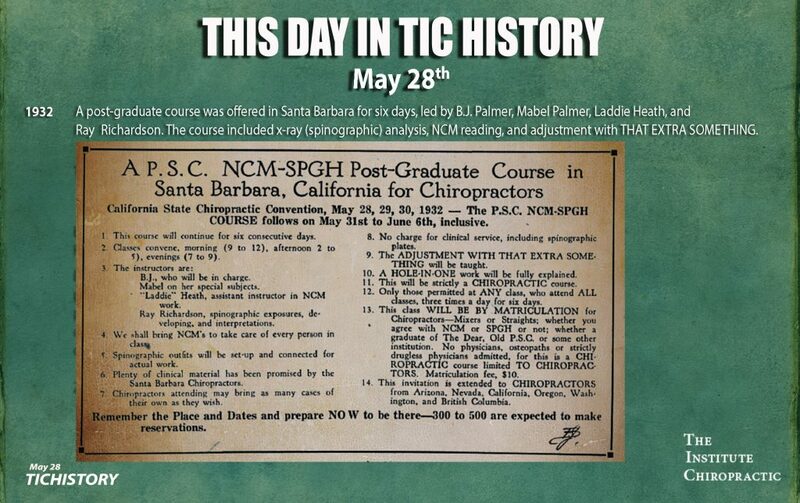 The process of analysis has been such that the major is made by using the simple principles of chiropractic, known as palpation, and nerve tracing. Every major subluxation is accompanied by either a hot spot, a cold spot or a tender nerve and may be a hot spot and tender nerve or a cold spot and tender nerve. All of those places that appear to be subluxations and that do not have these things associated with them, are only apparent majors and not real. At any time under adjustment, should a new tracing develop or a new hot spot or a new cold spot, then these places are in the major and need to be adjusted. 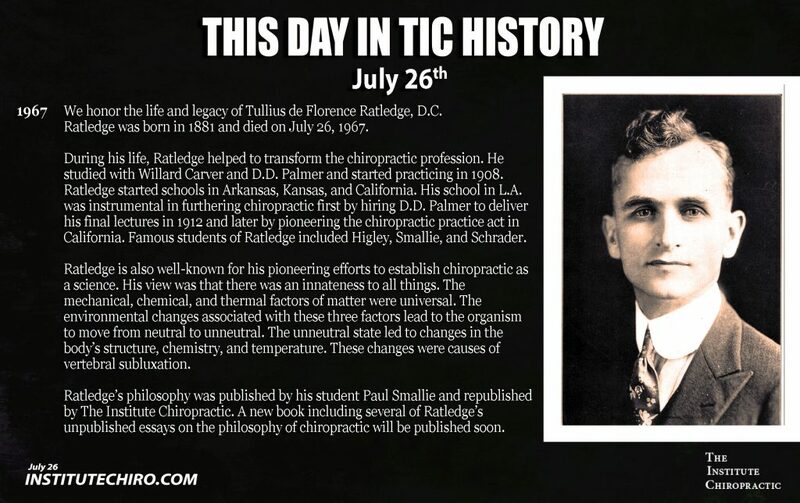 James Riddle Drain was a chiropractor, educator, school president, and philosopher. 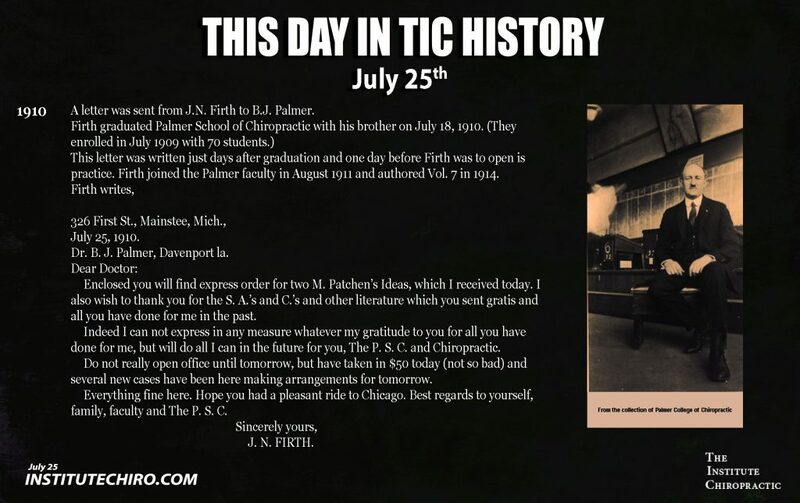 He authored two books, one unpublished manuscript, and other writings. 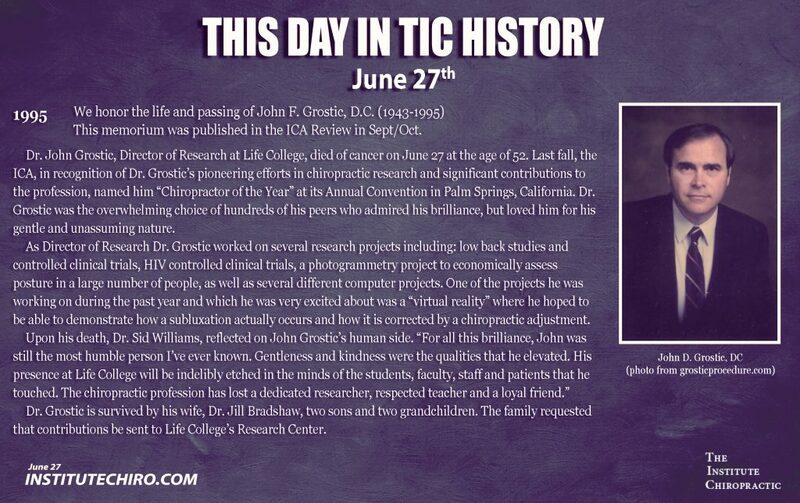 His legacy is found in his writings and his familial lineage (as there are still several chiropractors amongst his descendants). 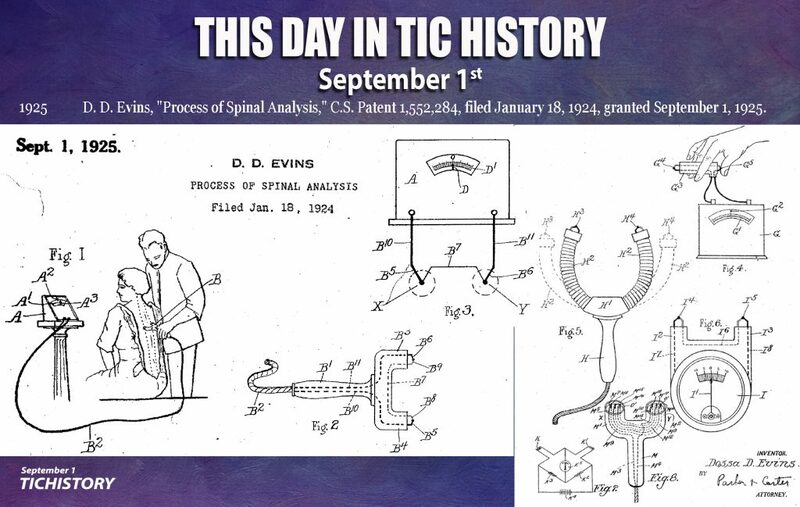 Historical perspectives on Drain and TCC were captured by Joe Keating with his Chronology of Texas Chiropractic College and his collaboration with Robert Davidson with their paper, That “Down in Dixie” School: Texas Chiropractic College Between the Wars. 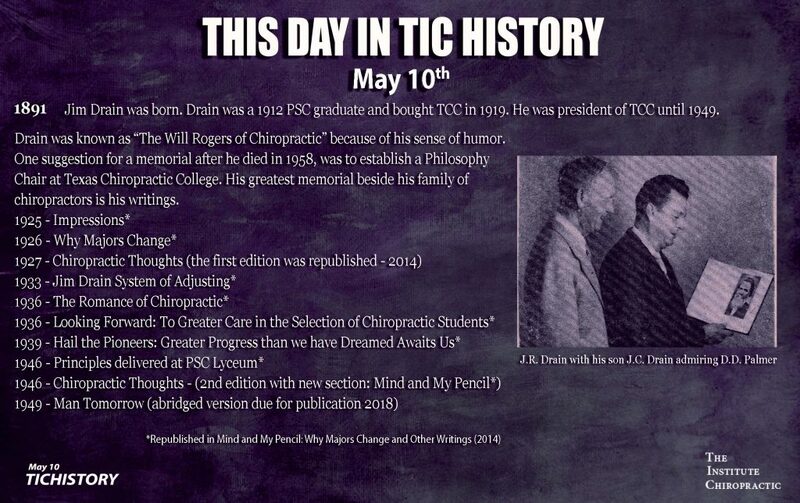 With the help and support of Drain’s family, we republished his 1st edition of Chiropractic Thoughts and a compilation of his writings as Mind and My Pencil: Why Majors Change and Other Chiropractic Writings. We plan to republish an abridged edition of his classic tome, Man Tomorrow (1949).